Pufferfish are members of the Tetraodontidae family, closely related to the triggerfishes, filefishes and boxfishes. Like their cousins the triggerfish, Pufferfish are well known for their bold personality and playful antics. In fact many aquarists refer to pufferfish as the “puppydogs” of the aquarium world. One of the unique behaviors of pufferfish that has given rise to their name, is the ability to inflate themselves with water when frightened. Some species possess spines that stand on end when they are inflated, giving them a menacing appearance used to scare off any would be predators. 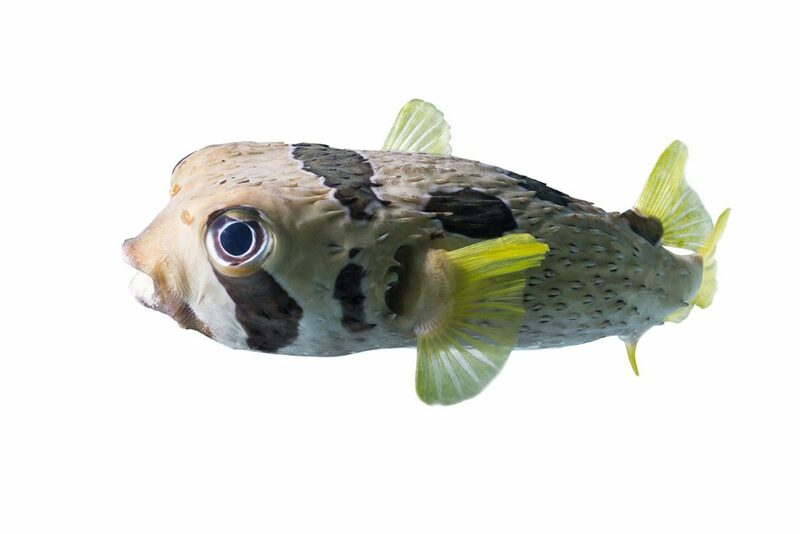 The Valentini Puffer (Canthigaster valentini) is one of the most commonly sold pufferfish species due to its regular availability and relatively small size. Other commonly sold species include the Porcupine Puffer (Diodon holocanthus), Dogface Puffer (Arothron nigropunctatus) and Spiny Box Puffer (Chilomycterus schoepfi). Pufferfishes are found globally in the tropics, as well as in the subtropics. They are entirely absent from subtropical zones however. While the majority of species are marine and brackish, some species are found in freshwater as well. Some species of pufferfish are targeted for human consumption, for a specialized sushi market. Parts of the pufferfish are toxic and if consumed, even in trace amounts is lethal! Pufferfish can make great aquarium inhabitants, provided their husbandry needs such as diet, water quality and tank space are met. Two of the most important aspects to pufferfish care are the tank size, as well as the tank mates. Pufferfish typically do well with species similar in size and temperament. Most pufferfish prefer a temperature range of 22C (72F) to 27C (82F). Pufferfish are generally not considered reef safe. They will consume ornamental invertebrates and may eat smaller fish. It is important to consider carefully what species of pufferfish may be best for your aquarium. While smaller species such as the Spotted Puffer (Canthigaster jactator) are suited to tanks as small as thirty gallons, larger species such as the Immaculatus Puffer (Arothron immaculatus) may be better suited to a larger tank. We suggest a diet based on Piscine Energetics Frozen Mysis, Piscine Energetics Frozen Calanus, Piscine Energetics Pellets (1mm, 2mm and 3mm) and Piscine Energetics Saltwater Flakes.